SHORTWAVE RADIO FOR YOUR CAR OR TRUCK! The BST-1 is a small, but high performance, DSP based, remotely tuned, all-band shortwave receiver that mounts out-of-sight in the trunk or rear deck area of your vehicle. With the BST-1 receiver, you can listen to thousands of shortwave broadcasts from the U.S and around the world. Hear music, talk, sports, information, and religious programming in English and many other languages. There is also AM "Ham" radio as well as CB channels. You tune it with a small handheld two button key fob and the audio from the shortwave frequency you tune is broadcast to your car FM radio. If your FM radio has RDS, you will also see the tuned shortwave frequency and signal level. No connection to your car's audio system is required - You listen through your car FM Radio. Mount it under a seat, in your trunk or hatchback area and plug into car power outlet. 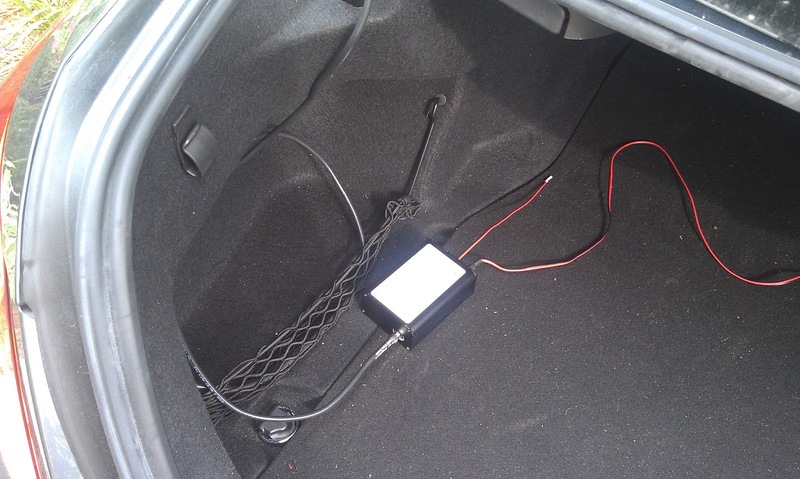 Plug in external antenna and you are ready to listen to shortwave on your car FM radio. 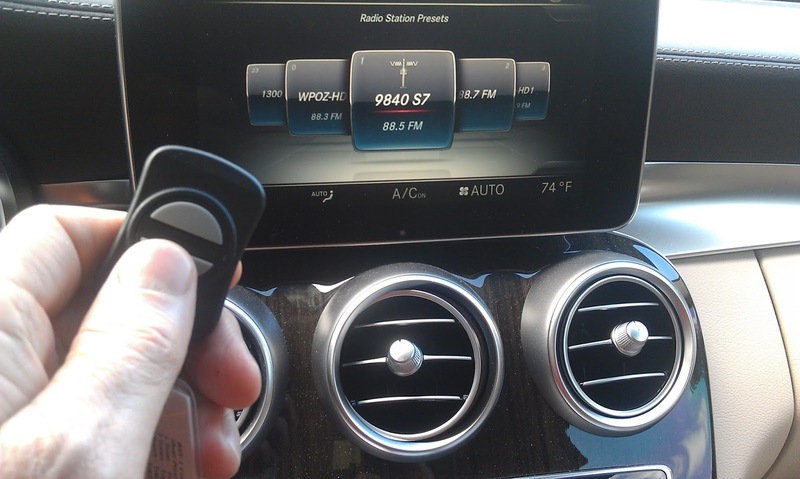 Use the key fob controller to automatically search from 100 memory channels or tune to any shortwave frequency. The shortwave frequency and signal strength will be displayed on car FM receivers that have RDS (Radio Data System). Even if your car FM radio doesn't have RDS, the BST-1 still works. You can simply press the bottom button on the two button wireless key-fob controller to start a scan of the factory programmed memory frequencies. It stops on the first active frequency. If you like what you hear, keep listening, if not, press to scan for something else. You can add new memory channels by just scanning in "tune" mode and if you hear something you want to add to memory, hold the top button for 4 beeps and it will save that frequency to a new memory channel. The most often used function, that of a scan through the memory channels, is just a quick press of the bottom button. Other, lesser used functions, are selected by the length of time that a button is pressed, with one to four short beeps issued as cues as to when to release the button to select a function. A hard-plastic selection guide is attached to the key-fob. Compact and rugged, the BST-1 is designed to be located out-of-sight in the trunk, under the seat, or rear deck area. 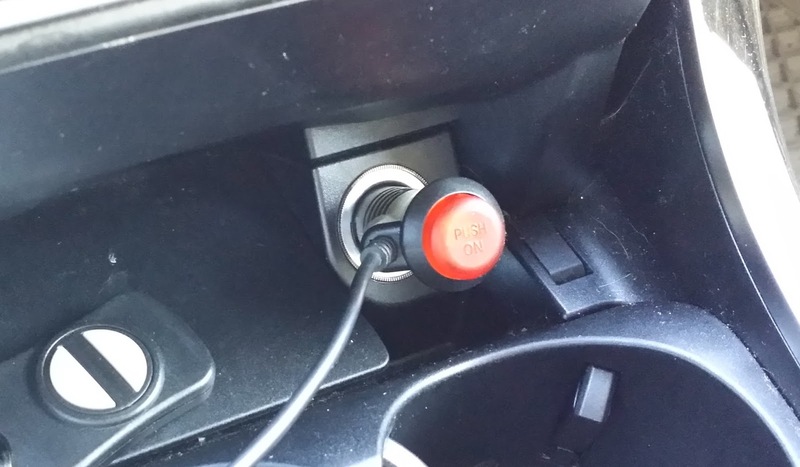 It is safe from theft, and removed from radio interference from the vehicle's electronic systems. A 10 ft power cable (supplied) connects the BST-1 to any car power outlet. The BST-1 is designed with a high impedance input so as to work with electrically short "whip" antennas. 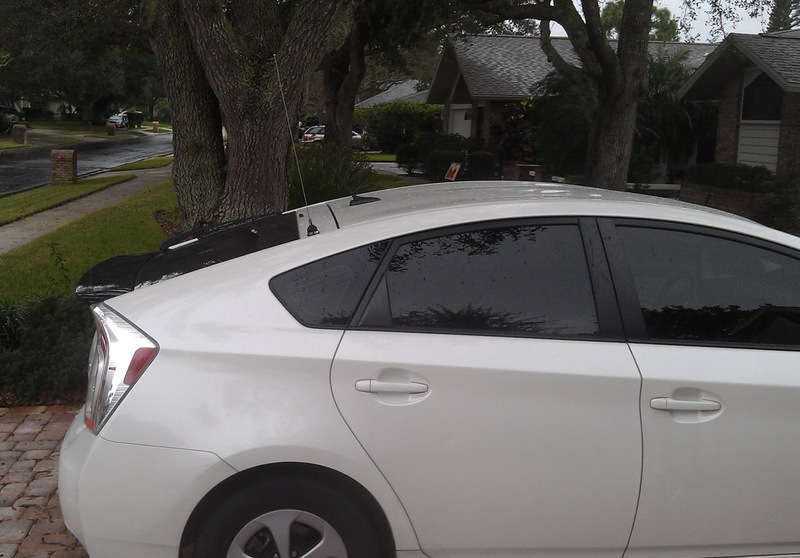 One antenna recommended is our Model CBST-1 trunk lid mount type with a 24" element. 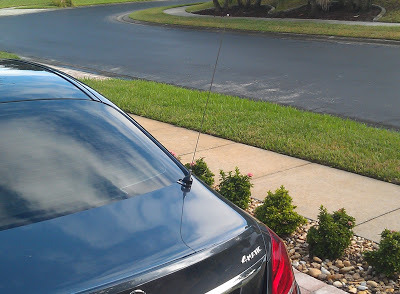 This trunk lid antenna is a no-hole mounting type and includes a rubber insulator under the mounting area to prevent any damage to the paint surface of the vehicle. The set-screw mountings provide a ground connection to the metal on the underside of the trunk lid. This style of mounting also works well with the hatch gate on SUVs or the top of a rear door on a truck. The coax cable is 7 feet long to keep shunt capacitance low so as to deliver higher signal levels to the BST-1 receiver. The coax cable has a RCA male connector to plug into the BST-1. All-Band Shortwave coverage - tune to any shortwave AM frequency from 2.3 to 26.1 MHz. There is also bonus frequency coverage from 1.7 to 30 MHz. This extended frequency range lets you listen to the 10 and 160 meter ham radio bands as well as all CB channels. Tunes in the 5 KHz channels used by shortwave broadcasters. A digital AFC (Automatic frequency control) circuit in the BST-1 is used to automatically compensate for shortwave stations that may be slightly off a 5 KHz channel. 100 Channel Preset Memory - The BST-1 is ready to start listening right away. 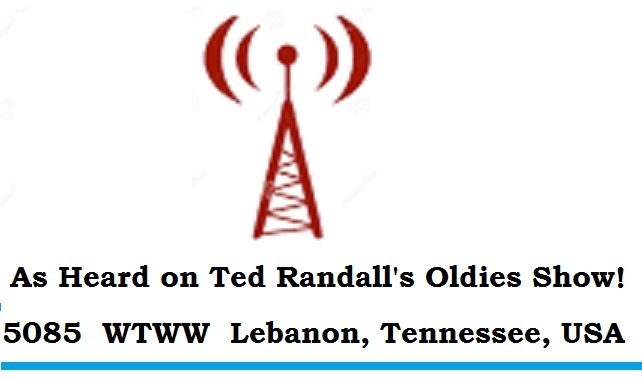 Comes with 50 popular U.S. and International shortwave stations as well as time station WWV at 2.5, 5, 10, 15 and 20 MHz. Start scan of Preset Memory with quick press of Key Fob button. Easily add new frequencies or delete existing memory channels using the key-fob controller. Tune Any New Frequency - Add to Memory - The BST-1 can be manually tuned to any 5 KHz channel in the tuning range and if desired, that new frequency stored in memory. Excellent Sensitivity - 0.5 microvolt at the antenna connector provides usable listening signal. This is equal to or better than the most expensive shortwave receivers. Automatic Gain Control - Keeps audio levels constant for weak and strong stations. DSP (digital signal processor) selectivity - Narrow 3 kHz for speech or wider bandwidth for Hi-Fi music. Noise Blanker - A digital noise blanker greatly eliminates any spark plug noise from car engine that could disrupt reception. Built-in High Fidelity Crystal Controlled FM transmitter - FCC Part 15 Approved - Has RDS to display the tuned shortwave frequency and memory channel number/ "S" meter on the vehicle's FM radio. Four BST-1 broadcast FM frequencies can be selected by the Key Fob Controller so you always have a clear FM channel to use. Operates on 88.3, 88.5, 88.7, and 88.9 MHz - one of these channels will always be clear in your area so you can receive the BST-1's FM transmitter. If you drive into another area, you just use the key-fob to select one of the clear frequencies in that area. Morse Code Annunciation! - If you know Morse code for the numbers 0-9 (very easy to learn), you can use the Key-Fob to activate a Morse code annunciation of tuned frequency. This aids in operation if your FM receiver doesn't have RDS display or if you can't look at the display on the FM radio while driving. Key-Fob command for instant selection of WWV time station. - Tunes to 5 MHz and then a quick press top of the top button sequentially advances to the other WWV frequencies of 10, 15, and 20 MHz. Or, reverse tuning direction to select WWV at 2.5 MHz. High or Low sensitivity selection by the Key Fob - Optimum performance can always be obtained during conditions of very strong signals. Rugged construction - Designed for automotive use. DC Car Power Adapter - 10 ft cable with illuminated on/off power switch. What is Included - BST-1, 433.92 MHz Key Fob Controller, and Car Power Adapter (10 ft). Our CBST-1 antenna is available separately or you can use any type of "whip" antenna with RCA male connector to plug into the BST-1. Listen carefully to the actual on-the-air reception in the demonstration videos or other videos shown in user reviews. 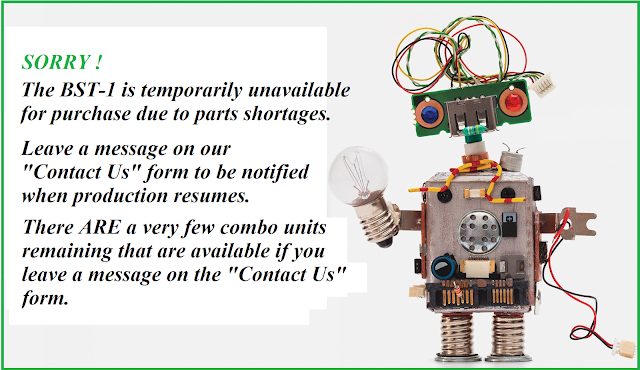 They are representative of what you will hear with shortwave reception of the BST-1, or any shortwave receiver, especially in mobile operation. Shortwave reception is not always like local AM/FM stations. While many shortwave stations will be received with good quality, the physics of shortwave propagation can result in momentary or continuous noise, signal fading, and momentary audio distortion on some stations. Local noise sources, such as power lines and other radiating sources can also affect quality of some signals. 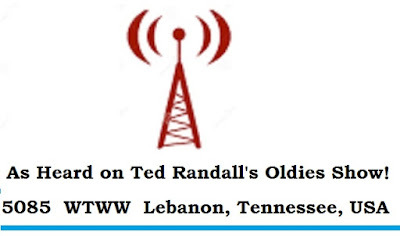 Experienced shortwave listeners completely understand this and enjoy hours of listening to the diverse range of programming available. This product will perform with the electrical specification as listed and illustrated in actual off-the-air recordings shown in the demonstration videos. Warranty/returns are only for an actual defect in the product preventing it from meeting its physical specifications listed in the Users Manual. The BST-1 will be shipped with only a 1 page quick start guide. Download the complete operating manual from the MANUAL Tab at top of this page.